Mr. Caldon R. Norman passed away on January 29, 2017 at the age of 91. He was born September 4, 1925 a wounded WWII POW, a passionate educator and an enthusiastic golfer, passed away Sunday, Jan. 29, 2017. He was 91. A descendent of Swedish immigrants, Cal was born and raised in Minneapolis, Minn. His family of six was poor, he said, but never wanting. He had strong Depression-era values, where good manners, hard work and accountability were expected. 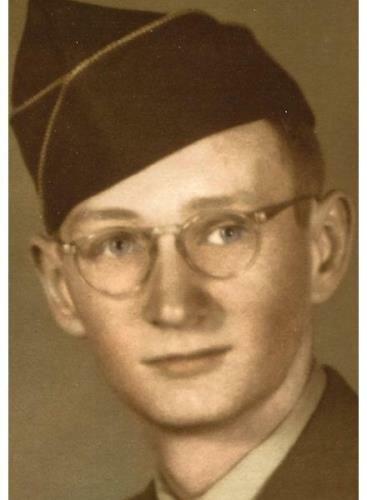 Drafted in 1943, he entered ASTP basic training in 1944 and later joined Company A, 398th Regiment, 100th Division. Cal was shipped to Marseille, France, in October 1944. He was his platoon's runner. Cal entered Wingen-sur-Moder, Alsace, in a Dec. 3 night-time action to clear out enemy soldiers. The Germans retreated and then counterattacked. Cal was wounded by a concussion grenade, and he and about 100 other GIs were captured. Cal was a POW for 4.5 months. Soviet forces liberated him from Stalag 4B in April 1945, and then he escaped from the Soviets in May with six friends through a break in the barbed wire, carrying all of their possessions in a baby buggy. In his bible/diary: "May 16. 2 p.m. In GI hands. 6 p.m. First white bread. May 18. First orange." Cal was awarded the Bronze Star and two Purple Hearts. He later wrote a well-sourced manuscript about how an entire company of soldiers was captured, and he edited the Company A newsletter, which became an emotional connection point for the many men who were wounded or captured on Dec. 3. Post-war, he graduated with a B.S. of Education from the University of Minnesota, attended the University of Oslo in Norway, and earned his Masters of Education at the University of Oregon. Late in life, he took up his beloved golf, dragging his two sons to a number of rough-and-tumble public courses where it would be difficult to find anything resembling a green. Cal loved classical music, knew all the words to "Ode to Joy," was a season ticket-holder at Chamber Music Northwest and taught himself to play both the autoharp and recorder. He was a passionate believer in public education and began teaching in Portland in 1949. He taught at Kellogg and Youngson, and later was principal at Collins View, Woodmere, Lents, Jason Lee, Laurelhurst-Normandale and Laurelhurst-Hollywood. He was a member of 15 different educational professional organizations from 1965 to 1988, including serving as president of both the Portland and the Oregon Elementary School Principals Association. Services were March 3, 2017 at Moreland Presbyterian Church 1814 S.E. Bybee Blvd., Portland. In lieu of flowers, please send remembrances to any Portland Public School library.